Buildings at the Argentine Almirante Brown Antarctic Base by shores of Paradise Bay in Antarctica. Paradise Bay is one of the most beautiful locations for tourists visiting Antarctica. Paradise Bay, also known as Paradise Harbour, is extremely beautiful and surrounded by huge snow covered cliffs. My time in Antarctica was spent exploring the Antarctic Peninsula as part of a photography group tour I co-ran with Aurora Expeditions. If you ever get the chance to visit the Antarctic Peninsula try to ensure Paradise Bay is on your itinerary. You won’t regret it. Reflections in a small lake near Brown Base at Paradise Bay in Antarctica. 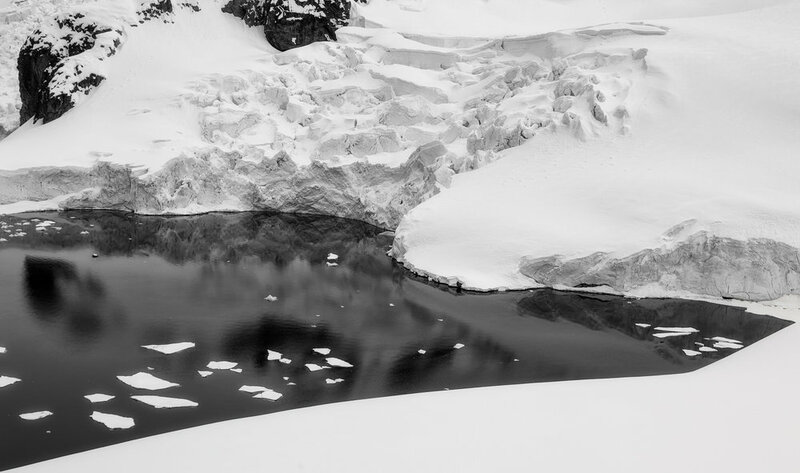 Antarctica is, for the most part, a melancholic and monotone landscape. The dominant color of the light in Antarctica is blue/grey, though sometimes the water can appear almost black. That’s not to say Antarctica isn’t beautiful. It most certainly is. But an Antarctica cruise is also challenging and, in addition to the time and financial commitment involved in getting there, you’ll find your notions of space, depth and scale challenged in this monumental landscape. Antarctica is unique. There’s simply nowhere quite like it. The strongest colors you’ll see will be the aqua blues of icebergs; the ice-stained red by penguin poo, a consequence of a krill rich diet; and the research stations comprising, for the most part, of red painted wooden buildings. A small lake near the Argentine run Almirante Brown Antarctic Base at Paradise Bay in Antarctica. As you can see in scenes with a very muted color palette I’d sometimes opt for a black and white rendering as a way of depicting this epic landscape. That approach works really well when the scene in question is relatively high in contrast and contains strong shapes, lines and textures. While the above photo is a tiny fragment of the larger landscape it’s the near black shape of the small lake that caught my eye. I love the way the black and white rendering emphasizes that shape against the surrounding snow. In western culture we read from left to right. This image is partly dependent upon that notion, which I think adds some energy into this otherwise static image. Members of the tour group I co-ran to Antarctica making the steep climb, thorugh heavy snow, up the hill at Brown Station. One of the most memorable adventures on the tour involved a zodiac landing and a steep ascent to a hilltop view overlooking the sublime Paradise Bay, one of only two ports were cruise ships stop on the continent. There was loads of snow and ice to meet us on our arrival at the picturesque Brown Station on Paradise Bay. Navigating our way along the slippery path from the small jetty, were our zodiacs dropped us off, over the short distance to the beginning of the climb was no easy task. No sooner had I arrived I proceeded to sink, knee high, into deep snow. Still it was fun and, together with most other members of our group, I huffed and puffed my way up to the top of a nearby hillside for panoramic views of Paradise Bay and the surrounding landscape. The view was gorgeous and I remember sweating like the proverbial, having stacked on way too many layers for this particular excursion. Glenn Guy, the Travel Photography Guru, pictured high above the spectacular Paradise Bay in Antarctica. While on top of the hill overlooking Paradise Harbour one of the team from Aurora Expeditions, Terry, made the above picture of me. Actually he insisted, for which I’m immensely grateful. Like so many other photographers I have very few photos of myself. It never really worried me though, because of my presence on the web, it’s important to have a few photos so that folks know what I look like. As you can see Terry’s almost as good a photographer as he is a barman, a job at which he excels. What else can I say: he's happy, honest and a keen listener. The perfect barman, you might say. I made sure I made a couple photos of Terry, from the opposite direction. The light and scenery for my photo of Terry was even better than the one of me directly above. You can check out my photo of Terry the Barman here. It was an achievement for all who made the climb to the top. We were all rewarded with fantastic views and then a great surprise as we got to slide down the hill on our backsides. Believe me it was a far quicker and more exhilarating experience than the slog upwards. A small iceberg floating in the waters off the snow covered, mountainous terrain at Paradise Bay in Antarctica. There is no place like Antarctica and a cruise down to the Antarctic Peninsular is an amazing experience. If ever you get the opportunity for an Antarctica holiday I’d certain recommend a tour. If you do a little checking you could even find a tour that will allow you to explore your favourite hobby in spectacular surroundings. I co-lead a photography tour, but there were also kayakers and underwater divers on our particular Aurora Expeditions tour. There’s just so much to see in Antarctica and the opportunities to make great landscape and wildlife photos are incredible. Antarctica is a place for reflection. This massive, wild continent forces us to contemplate our life and our relationship with the natural world. And that can only be a good thing. Wouldn’t you say?